For hundreds of years, stained glass windows have been a fundamental design element of churches and cathedrals. Besides being colorful and attractive, these beautiful works of art often tell a story to anyone who views them. Stained glass remains popular in Liturgical settings, homes and offices, dramatically transforming a space into a wonderfully inviting environment. Doors, windows, sidelights and skylights are just a few of the many applications well suited for stained/leaded glass. Stained glass can also be encapsulated within an insulated glass unit which will increase energy efficiency and aid in the protection of the stained glass itself. 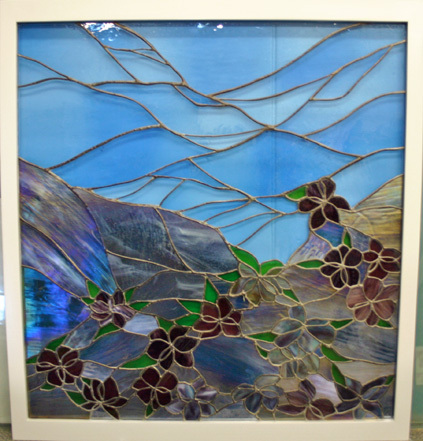 Classic Glass has offered stained glass restoration for over 29 years. Our expert craftsmen have repaired everything from Tiffany lamps to large scale cathedral windows. In some cases leaded glass can be repaired in place, however extensive restoration requires that the glass be removed and brought to our facility. An evaluation must be conducted to assess the damage and labor involved and an estimate will be provided . 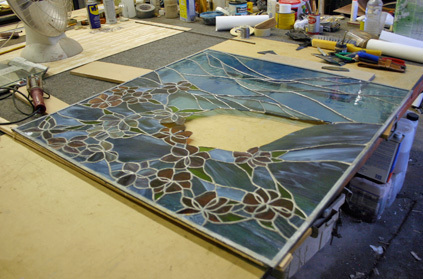 The images shown are from a recent stained glass restoration performed at our studio in Virginia. One challenging aspect of this repair was that the original glass used was no longer available. Artist, Rudi Waros “plated” two pieces of glass (blue opalescent + clear textured iridescent) to achieve a nearly perfect match. In addition, Rudi built the wooden frame. Authentic stained glass fabricated at Classic Glass is hand cut and assembled using traditional techniques. We stock a large selection of cathedral and opalescent glass including many clear textures. This entry was posted on Thursday, February 25th, 2010 at 9:09 am	and is filed under Decorative Glass. You can follow any responses to this entry through the RSS 2.0 feed.Both comments and pings are currently closed.